Difference between revisions of "J-Trace PRO Cortex-M"
J-Trace PRO V2 Cortex-M and J-Trace PRO V2 Cortex do not use the SEGGER USB driver like J-Links do, but they use WinUSB instead. 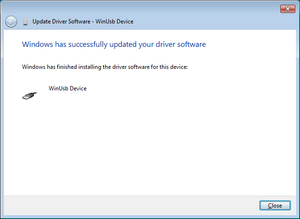 WinUSB was distributed by Microsoft via Windows Update so in case a USB device needed WinUSB, Windows downloaded it automatically in the background, where necessary. 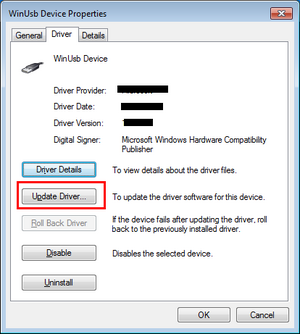 However, Microsoft changed their policy for Windows Vista / Windows 7 and WinUSB is no longer distributed via Windows Update. This may now lead to "no USB driver found" like problems when connecting J-Trace PRO to a PC for the first time. If you still run into any issues, please contact SEGGER directly. J-Trace PRO is incorrectly detected as a HP printer device. This is a problem with the HP BIDI printer driver and Windows 7 / Vista. 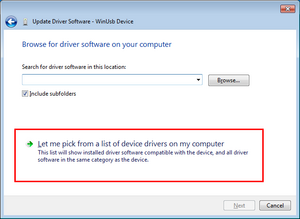 The wrong driver is assigned to J-Trace and it cannot be used with the J-Link/J-Trace software. This happens on PCs where the HP BIDI driver is installed '''before''' any J-Trace was ever connected to the PC. In order to fix this, the correct driver needs to be assigned to J-Trace manually. This only needs to be done once. J-Trace PRO is incorrectly detected as a HP printer device. This is a problem with the HP BIDI printer driver and Windows 7 / Vista. 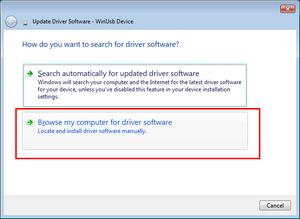 The wrong driver is assigned to J-Trace and it cannot be used with the J-Link/J-Trace software. This happens on PCs where the HP BIDI driver is installed before any J-Trace was ever connected to the PC. In order to fix this, the correct driver needs to be assigned to J-Trace manually. This only needs to be done once.